A 60 year old man with no significant past medical history presents with hematuria and left flank pain. A CT scan shows a 2.7 cm solid mass which appears entirely contained within the renal parenchyma. An intravenous pyelogram shows that the lesion is hypovascular. 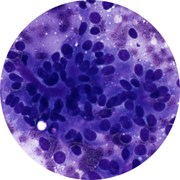 An FNA biopsy specimen is cellular, showing intact papillae surrounded by bland, uniform cells. The cells are cuboidal to columnar with fine chromatin, small, single, inconspicuous nucleoli, and scant to moderate dense, granular chromatin. Rare psammoma bodies are present. Focal areas of necrosis and hemorrhage are also present. A diagnosis of papillary renal cell carcinoma was made. Papillary RCC accounts for 10-15% of all renal carcinomas. It is a malignant renal tumor in which at least half of the lesion grows along papillae. Two morphologic types have been described. Type 1 tumors have papillae covered by a single layer of small cells with scant cytoplasm. Type 2 tumors are covered by pseudostratified nuclei, frequently of higher grade and with eosinophilic cytoplasm.